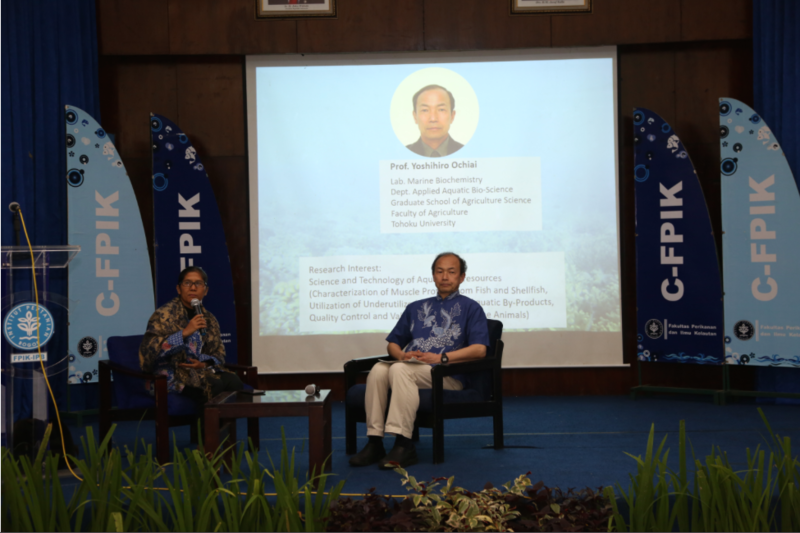 The Faculty of Fisheries and Marine Sciences, of Bogor Agricultural University (FPIK IPB) organized the 1st ETS (EMBRIO Talk Series) Meeting, on “Tuna Fisheries in Japan: From Farm to Table”. During which Prof. Dr. Yoshihiro Ochiai, of the Tohoku University, Japan, was invited as the resource person for this international meeting. Prof. Yoshihiro has been working on tuna for decades. He said that most of the tuna is a species consumed in Japan, mostly for sashimi. Bluefin tuna is regarded as the premier sushi fish. “Tuna is the sushi in a sushi restaurant. If you have good tuna, you have a reputation of being a proper restaurant.” Prof. Yoshihiro delivered several species of tuna that are consumed in Japan such as Atlantic Bluefin Tuna / Pacific Bluefin tuna, big eye tuna, yellowfin tuna, albacore, and skipjack. He said that in terms of the colour of meat, each tuna species has different characteristics. Japan leads the world in tuna consumption. It consumes one third of the world’s tuna production and 95 percent of the world’s toro. The highest consumption of tuna in Japan is of the Pacific bluefin tuna type, its consumption can reach 98% of the fish captured in the North Pacific. The price of tuna per kilogram in Japan is 1400 JPY (Rp 182,000 / kg); while for the price of frozen bluefin tuna fish is 4000 JPY per kg (Rp 520.000 / kg). For yellowfin species the price is around 1200 JPY per kg (Rp 156.000 / kg). Data in 2012 shows that the consumption of tuna from big eye species increased by 40%.